Crouse-Hinds Arktite® APJ series Grounding style 1 reverse interior mating plug operates at a voltage rating of 600-Volts AC, 250-Volts DC at 50 to 400-Hz and amperage rating of 100-Amps. It is made of copper-free aluminum to withstand minimum voltage. 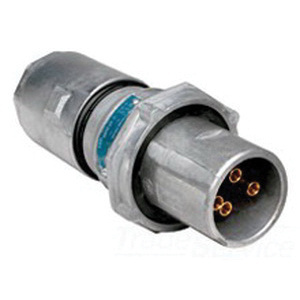 This water tight mating plug is used where temporary power is needed, such as at trailers, building units and heavy machinery. It is suitable for motor generator sets, compressors, heating and cooling units, welders, conveyors, lighting systems and similar equipment. Mating plug meets UL 1682, 514, 1010 listed, CSA C22.2 number 182.1, CE marked to LVD 2006/95/EEC standards.